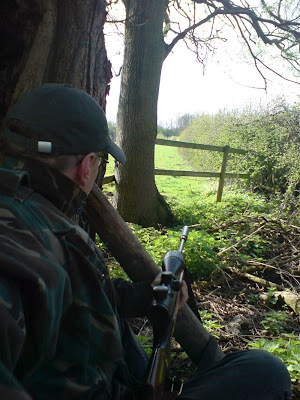 Fleeing cattle, the other day, I nipped into a little scrubby patch of wood at the intersection of four fields and, sticking my head round the side of a tree - expecting nothing - saw, through the bars of a fence, a rabbit sitting in a little depression alongside a hedge. Like a fool - with a great tree alongside me whose support I chose to ignore - I took a standing shot at it. I've barely fired the Weihrauch at all from a standing position - its great weight and my no less great feebleness have always dissuaded me from practising - and so it was no great surprise, despite my efforts to hold the rifle true, to see the rabbit - together with another one, even closer, that I'd not noticed at all - dash away unharmed. I stood there for a while - thinking that there was at least another twenty minutes to wait before the chance of another shot from the same spot - and practised bracing myself against the tree with the gun. This was certainly better for steadying my aim but, even so, the sheer weight of the weapon defeated me after no more than half a minute in this position. I picked up broken fence-post nearby and propped it against the tree. Sitting down, I found that I could use the post to both steady my arm and bear some of the weight - altogether a better position. I stayed for a while but, after all the noise I'd made dragging things around in the undergrowth, I decided that this was a spot that I'd be better off returning to another day than persevering in right then. A heavy rifle is no bar to shooting very well from a standing position, you know; I do this with a heavy Steyr target rifle and do rather well, too. The trick is in the shooting position. Don't try to hold a heavy rifle steady on muscle alone; it doesn't work. Get your supporting hand in close to the trigger guard, and stand sideways to the target with your elbow resting on your side as you hold the gun. That gives you a mostly bone-only support for the rifle, which is much, much steadier than a muscle hold. For best efforts, stop breathing as you get onto aim, and let the sight picture steady before you go for the shot. When you do fire, keep on aim after the shot goes; deliberately hold the aim for a few seconds afterwards and then come off aim. The reason for doing this is if you come off aim immediately after the shot, you're usually subconsciously lowering the gun as you take the shot, which de-stabilises the rifle and results in it going off aim. Try this one; works a treat for us target shooting bods. That's very helpful advice; thanks for taking the time to pass it on! I like your writing, it's very personal and well written. Thank you very much, Gunslinger! Still can't sleep cos I'm constantly re-fettling my gear for the show and coming hunts. This might help. Slings are your friend and I personally like these for field use. Shooting sticks are also a wonderful option. Not a shooting bench but you can get damn close with practice. That's a helpful link, Tom, thanks. I have used a variation on the Ching Sling - actually just looping my left arm through the strap to - kinda - triangulate the supports. It does work but I end up having to have a few goes to get the right grip and then that's just me waving my arms and the gun around above my head for a few minutes which tends - at least when I do it - to act as a pretty good rabbit scaring procedure. A bit more practise is needed on my part to get used to this one! Still can't sleep cos I get to go hunt big things! You need to come over here sometime and work out on the long range rabbit course a bit north of me! Same techniques work for air rifles and are perhaps more critical with the limited ME of a UK air rifle. Practice (err, practise) makes perfect if it's perfect practice.